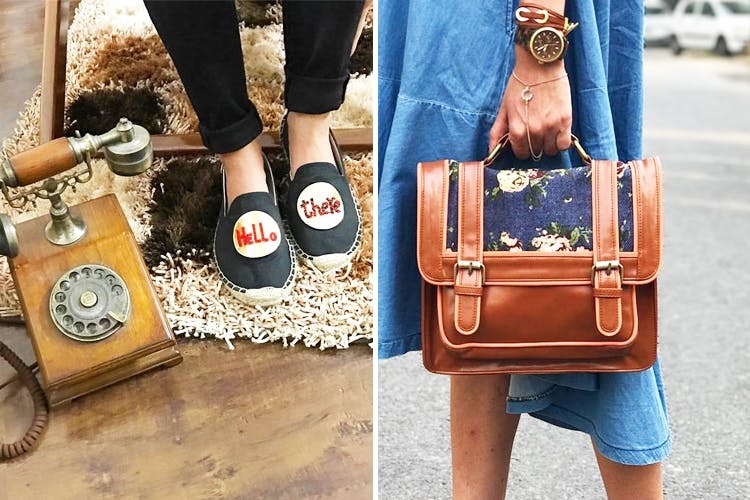 The Love Hook is a Delhi-based brand that does bags, shoes, bracelet charms and badges, all of which, come with colourful patches. They even offer patches separately that you can use to upcycle your boring old jeans or Converse. The Love Hook's stuff is all things colourful, young and bold. In the footwear category (starting at INR 1600), they've got a variety of sneakers and the blogger favourite Espadrilles in black, white and super glittery ones too that are anything but plain. All of these come with the 'wow', hastag, 'Superstar' or 'Pretty Awesome' patches. A few options for flat - bow sliders and strappy sandals - are also available on their website. For bags (starting at INR 1500), they've got duffel ones (it looks so cute), backpacks and a few totes that also come with patches. Bag charms (like the clip-on tassles), pin-up badges and more individual patches for INR 150 (think those of flamingos, hearts or with words - 'Whatever', 'Wow' and 'Blah') are some of the other things The Love Hook has to offer. Some of their stuff is a bit too loud and bright for those who're used to subtle colours and designs. We also felt that their bag options were slightly limited.